If you have a pickup truck, you probably want to get the most out of the performance for it. This means that you will want to add the right pickup exhaust for your truck. There are many different brands to choose from. And, each of the brands that you can add to your truck will add something different to your truck. 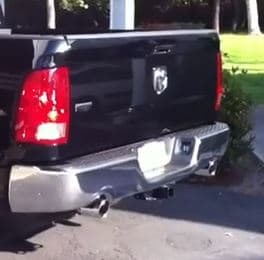 When you are choosing exhaust for your pickup, it is all about air flow. You want to have an exhaust added to your truck that allows that air to flow through the exhaust system easily. This can be dual exhaust and pipes that give your exhaust the maximum flow. To start with your pickup exhaust, you will want to consider the different manifolds, headers and pipes, that can be added to your truck. These are the things that will give you the maximum flow that you want your truck to have. There is also the muffler, which is an important part of the exhaust system of your pickup. There are many different brands that you can choose from, which include Magnaflow, Flowmaster and many others. Most of these brands will sell you the complete exhaust system that you need for your truck. If you want to be able to get the best flow for your truck, you may want to use Magnaflow pipes. They have all the different connections that you will need, and also have been mandrel-bent. This means that the curves in any bend in the pipe have the same diameter as the rest of the pipe. It is something that gives that your exhaust the optimum flow you need for performance. There are also the mufflers, which you can get from several major names in exhaust. The Flowmaster mufflers have been around for a long time, and they have something for almost any model vehicle on the market. It is probably the best brand for things like headers and other performance exhaust parts for your truck. If you want to add a cat-back system to your truck, Magnaflow has the best products when it comes to catalytic converters. They will give you the best products that allow the exhaust to flow smoothly in your truck. There are many different choices to make, when it comes to the exhaust for your truck. With the right exhaust system, you will be able to improve the performance of your truck drastically.